Time's profile of Rep. Alexandria Ocasio-Cortez proves that while she had an American childhood experience like millions of others, the Congresswoman's vision for the country is wholly antithetical to the ideals which made it possible. After the Time piece, a more enlightening Twitter revelation by Ocasio-Cortez shows that our country's historical lessons, and what has made this nation so great, are totally beyond her sphere of recognition. Ignorance, her words unwittingly evince, is the driving factor of her agenda. Time's profile highlights that Ocasio-Cortez's mother and her father sought a better life for their kids. While a child, her family moved from the poorer Bronx towards the wealthier Westchester County. Ocasio-Cortez was raised in a home that promoted education while at the same time valued hard work. The 29-year-old cherished the days she joined her mother's house cleaning business duties while she also found interest in microbiology. She was acutely aware her life was better economically than her cousins. She would travel to family gatherings, coming away with the belief that "ZIP code determines destiny" based on what she saw in comparison to her new hometown. As she began young adulthood, her father tragically passed away from a battle with lung cancer, but not before encouraging her to "make him proud." With the loss of her father's architecture business income, her mother took on another job. Ocasio-Cortez took on student loans for college which saddled her in debt. But, despite growing up with two parents who loved her, a fantastic education, and living in a wealthy district Ocasio-Cortez says she has never seen American prosperity. In her eyes, the Great Recession, the student loan crisis, rising healthcare costs, and inaction on climate change among other problems have robbed her entire generation of success. These are indeed all important issues which hamper economic growth. But in her mind, America cannot solve them because we are not concerned with being "morally right." "I think that there’s a lot of people more concerned about being precisely, factually and semantically correct than about being morally right," she once told CNN's Anderson Cooper. For Ocasio-Cortez, "morally right" means more government intervention, naysayers be damned. Every single one of her policy solutions increases the size and scope of federal power. But if she focused more on the "precise facts" of these areas and others, she would understand that these problems were started by big government, not a lack of American morals. The great recession began because government interference forced banks to lend risky home loans to poorer individuals. The government knew these people could not pay them back, but made banks give loans under the guise of achieving the "American dream." Because of the government's involvement, banks did not care about defaults because they knew they would be paid anyway. In 2007, when this practice finally caught up to the economy, the country blamed Republicans. But it was Democrats who started this and its Ocasio-Cortez wants to continue similar practices. Student loan debt is astronomical because colleges raise prices every year. They do so because federally backed student loans guarantee cash flow to these schools. Just like the banks, what does college care if a student is able to repay their loans once they graduate? The money backed by the feds is already in their pocket. Again, if the government quit "guaranteeing" more and more money each year, the country wouldn't be stuck with a student loan crisis. The New York Congresswoman says "Screw paying for college, let us just have the government make it free." High deductibles? Thank Obamacare. As noted by Justin Haskins, "Health insurance premiums increased sharply in 2018, driven in large part by Obamacare’s anti-free-market penalties, mandates, and regulations. Cost increases for health insurance plans sold on Obamacare exchanges were particularly high." Again, the government told the American people something was good for them, forced numerous actors into making decisions, and again made everything way too expensive. As Haskins notes, the solution to high deductibles is " to implement essential reforms based on free-market, pro-liberty principles" that promote "competition and innovation." 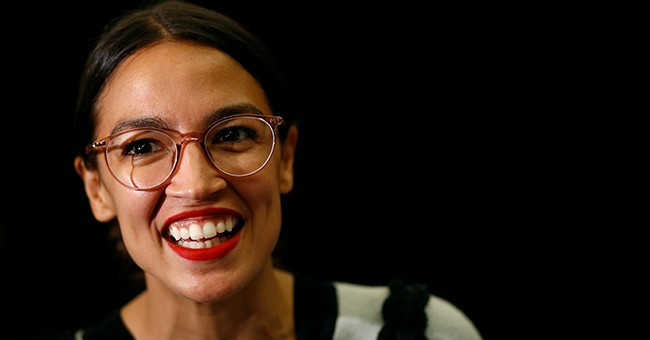 What does Ocasio-Cortez say to this? "Let's provide Medicaid for all." But what about climate change? Ocasio-Cortez's proposal has been tried and failed in other countries. There is little evidence that it will reduce carbon emissions, but supporters fully admit it is a vehicle to transform the economy into democratic socialism. And why does she want democratic socialism so badly? For some reason, Ocasio-Cortez looks at the aforementioned problems and says "If only the government had done more, we would not be in this situation." Why doesn't she realize that history, and modern-day reality, shows government intervention exacerbates these issues? On Twitter she said admitted she was pretty ignorant of the past and relies solely on her own experience. Ocasio-Cortez essentially says that because she never "experienced" less government, she is automatically against it. She thinks bigger government means a better society. But if she had even studied a tiny bit of what she never "experienced" she would understand that America's most prosperous times have come when the government was limited. Why? Limited government means Americans have more choice. Americans, not the government, are better at deciding their future. Millions of Americans improve their children's lives just like her family did by moving to a better town or encouraging hard work and quality education. Contrary to her belief, it was not the "zip code" that defined her life, but her upbringing by her parents. Her parents were not forced or encouraged by government-backed guarantees to make these decisions, but by a determination to make sure their loved ones had a better life than they did. But if Ocasio-Cortez gets her way under Democratic Socialism, which has failed everywhere it has been tried, we would all be placed in the same "zip code." This means we would all suffer as big government decreases our ability to make choices while forcing supposedly good items like free healthcare, free homes, free education, and a cleaner environment upon us.